In a blink summer was over and school was starting. The older I get, the faster the time flies. I don’t have school aged children, but I have five grandchildren who love school. It’s always an exciting time for them, and fortunately, their excitement is contagious. 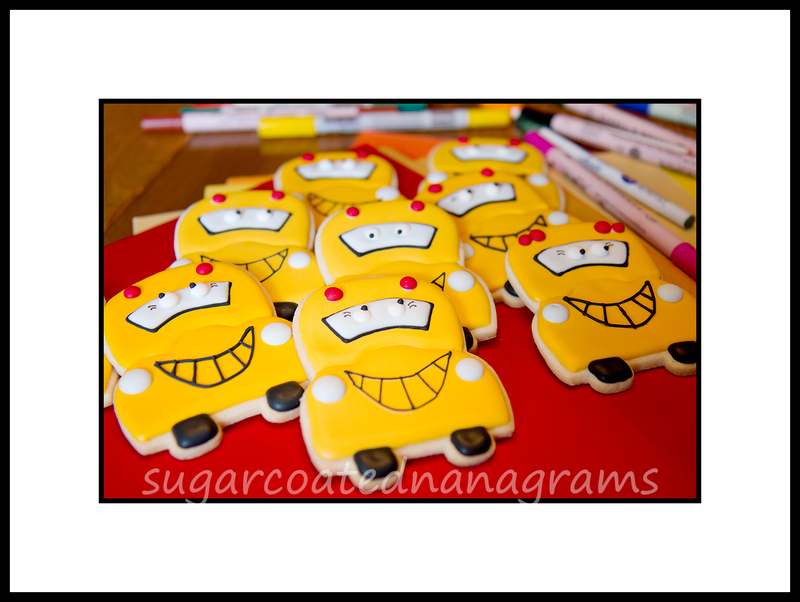 Last year I made pencil, paper and chalk board cookies to celebrate the start of school. Unfortunately, the time crept up on me, and before I knew it, it was too late to get them done in time. This year, Melissa asked me if I could make some school bus shaped cookies for Nate to give to his bus driver and the transportation department. They have been taking great care of Nate for several years, and Melissa wanted to thank them for all they do. I told her to send me a cookie cutter and I would give them a try. These cookies were so much fun to make. I love cookies with a little individual personality, don’t you? I still struggle with icing consistency, and you can see that I tried a few different consistencies and tip sizes to get the grill/smile to look the way I wanted it to. Needless to say, the recipients of the cookies were thrilled and very appreciative. I’m guessing that their jobs are pretty thankless, and it was an unexpected treat to get the cookies. I used my favorite sugar cookie recipe and royal icing recipe. You can see from the picture that the cookies are two different colors. I didn’t color enough frosting the first time and had to color a second batch. This is a lesson I should have learned a long time ago. Always color enough for the whole batch because it is impossible to duplicate a color. Have fun and let me know how yours turned out! I quite like the sight difference in yellow colors Barb. I helps the fronts of the busses and their details stand out better, while the tops of the busses look Sunny. Without your comments, all would have believed you were just being that much more creative. Not being anybody’s grandma, nor much of a decorated cookie practitioner, I am curious if you go somewhere and buy a cookie cutter in all these different shapes. Who woulda thunk you could buy a cutter in the shape of the front end of a bus?! Also, when did cooky change to cookie? Yes, you can buy cookie cutters in any shape you can think of especially now that so many people have 3D printers. Love these cookies and marveling at your creativity! TURN OUT.? I’m ordering from YOU! You are too funny! Thanks! !